The colors of the facades of the patrician residences, the blue and white poles for the boat mooring stand stylish along the banks, the smaller canals look like stages open on the 18th century, in a silent alternation of lights and shadows. Following the genuine habits of locals, before the start of the show, a cicheto is a must. Near Rialto, just out of the mainstream, you have to slip in the narrow Calle Bombasei, where you find “All’Alba”, a tiny osteria, frequented by the Venetians, with walls completely covered by vinyl records, blues and a lot of prosecco drinkable standing (better outside). If you want to taste the atmosphere of a genuine Venetian bacaro–the typical tavern that owes its name to the winegrowers who sold wine in San Marco square–after the show at the theatre, you need to walk a little. 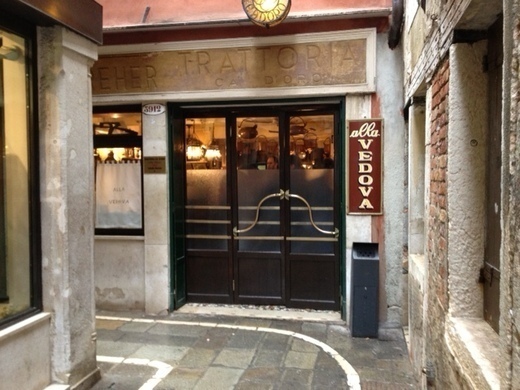 In Calle del Pistor 3912, there is the Trattoria Ca’ d’Oro, for everbody still “Alla Vedova”. Copper pots hanging on the ceiling and dark wood tables are reflected on the mirrors hanging on the walls, lamps and furnishing recall a different century… A big counter welcomes who doesn’t want to sit. The bartenders are busy slicing bread for the delicious baccalà mantecato, pouring prosecco in small goblets and proffering meatballs, sarde in saor, mussels au gratin, fried anchovies, octopus salad with potatoes, white polenta, all rigorously warm. Although if surrounded, in the background, by the whispers of an American couple, the giggles of girls celebrating a bachelorette party and the remarks on the flavors and fragrances of some elderly Venetians, there is a kind of relaxing warm that makes you feel at home. 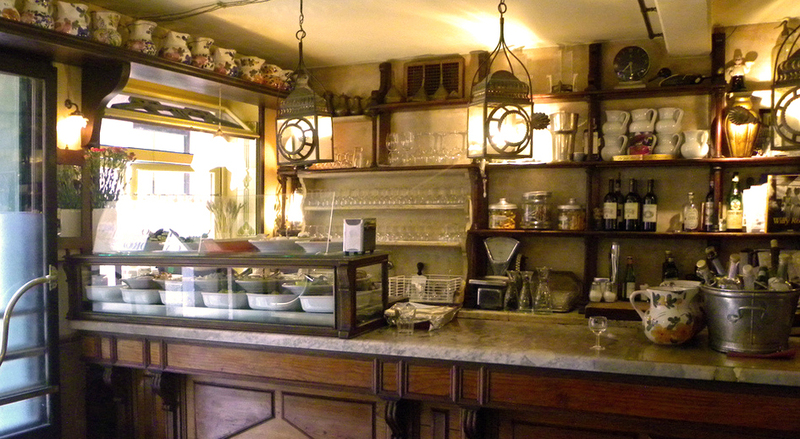 Pity it’s late: it would be nice to hold more lasting feelings of the earlier performace at the Goldoni, of the retro atmosphere of the tavern and the flavors of its cuisine.